Once the epitome of 1980’s style, this large bedroom had a sad, faded and forgotten air. The overall impression was of a room neglected and dull. However, a marble fireplace and huge windows leading onto the garden lent promise and inspiration for a new design. In keeping with the traditional elements of the bedroom it was decided that softly muted fabrics contrasted with patterned wallpaper would enhance the classical proportions. The existing bookshelves either side of the fireplace were repaired and repainted in a creamy off white, an exact match for elements of the wallpaper. Two of the walls were painted in a light stone colour. This provided a foil for the standout wallpaper. 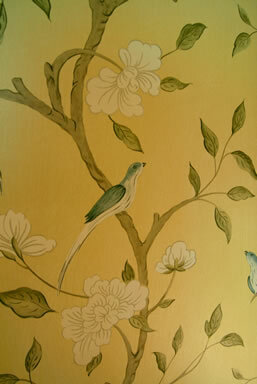 The large pattern on the wallpaper was adapted from an antique Swedish design and although elaborate it is executed in timeless and relaxing colours. 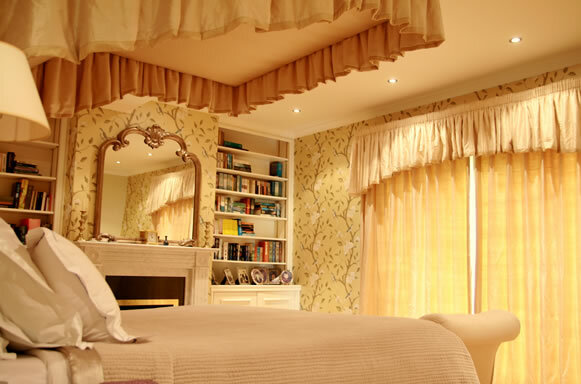 Both bed hangings and curtains are made in two warm golden shades of plain silk which echo the background colour of the stunning wallpaper. The sheen of the silk adds an extra dimension in both natural and electric light. 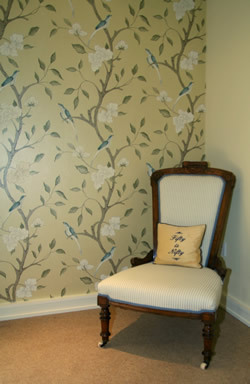 The birds featured in the wallpaper are rendered in varying shades of smoky blue. Bolder versions of these smoky colours were used for plump accent cushions on the bed. 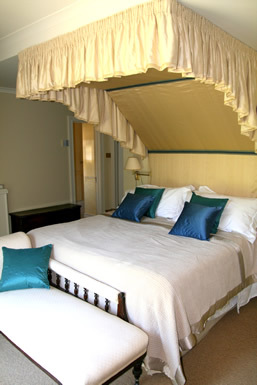 The canopy over the bed is further embellished by the addition of a woven braid to lend contrast to the golden silk. 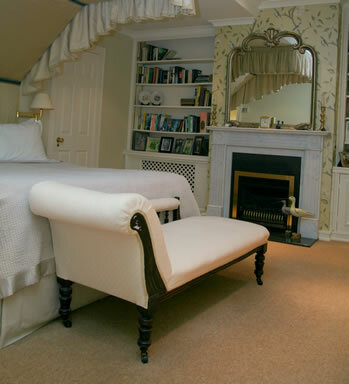 At the foot of the bed a classic chaise longue, upholstered in a neutral fabric acts as the perfect frame for the bright silken cushions, while retaining an air of relaxed calm. The existing marble fire surround looked dull and cold, however, the introduction of a large overmantel mirror now shows it off to great advantage. Now calm, relaxing and luxurious, this lovely room is a pleasure to admire. The colours are muted and welcoming but the vibrant wallpaper design ensures that it can never be labeled either faded or forgotten!